An infinity pool adds a real touch of exclusivity and luxury to your backyard, as well as making your swimming experience more relaxing. But what does an infinity pool cost? How is it constructed? And what are the main benefits for you and your family? Here we answer all your questions about infinity pools, to help you decide if this stunning feature is right for you. You will have seen infinity pools in advertising materials for luxury hotels around the world. They have a “disappearing edge”, so it looks as if the water along one edge of the pool is falling away into nowhere. This gives the swimming experience a whole new dimension. The disappearing edge makes you feel less confined in the pool, so as you swim you feel more like a part of the surrounding landscape. This enables you to become at one with nature, making your pool an even more relaxing place to be. In addition, you can enjoy the sound of rushing water and the gentle movement of the water as it cascades over the disappearing edge, which add to the benefits of your pool for relaxation. Infinity pools are usually built on sloping sites, making them ideal vantage points for looking down over the surrounding area. Whether this is a rural scene or a cityscape, it provides a beautiful view while you are swimming, sunlit in the day and illuminated with thousands of lights by night. As infinity pools are so closely associated with luxury, they bring an instant touch of opulence to your backyard, making your pool design the envy of all your friends. This highly unusual and attractive design feature can also be a great selling point when you are trying to achieve the highest price for your property. 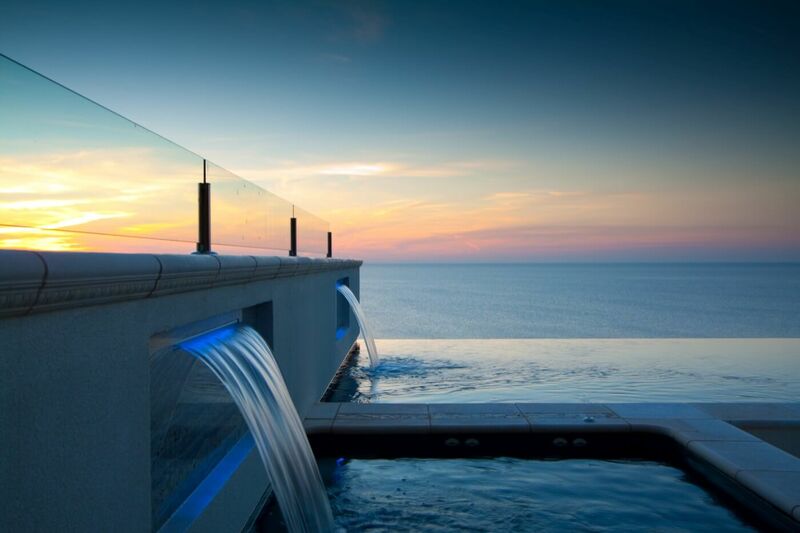 Many homeowners believe that infinity pools cost too much for them to ever own one themselves. However, more and more Australians are now opting for infinity pools in their own backyards, as they are so enjoyable and relaxing to swim in, and uniquely beautiful from an aesthetic point of view. It is true, however, that infinity pools are not cheap. Including a disappearing edge will add between $25,000 and $35,000 on average to the overall cost of your swimming pool. This means that an infinity pool does require a considerable initial outlay, when you consider that a fibreglass pool alone can cost anywhere from $40,000 to $70,000, even without a disappearing edge. 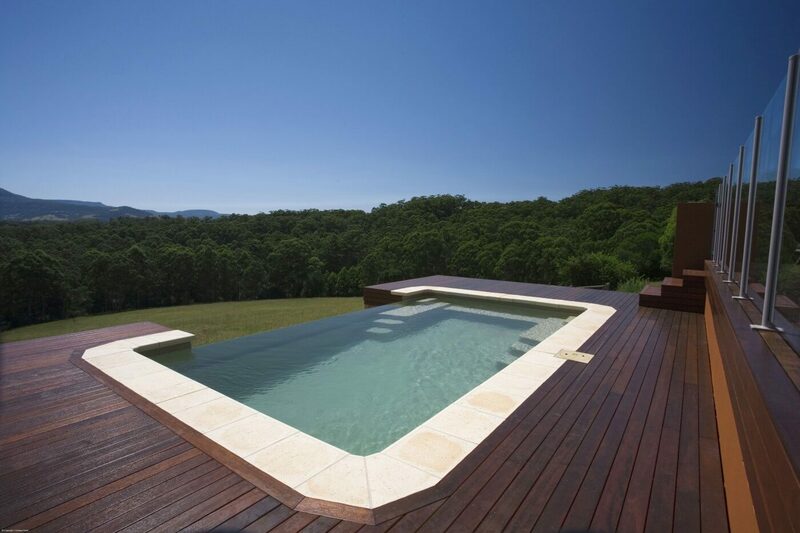 Fibreglass pools are not constructed in your backyard from scratch, which is why they are cheaper than concrete pools. The pool shells are prefabricated in a range of different shapes and sizes, to suit most customers, making them easy to transport and install. However, an infinity edge pool requires the design of the pool shell to be specially adapted so the disappearing edge can be included. As this is not part of the regular manufacturing process, it adds to the cost. Installing an infinity pool is much more complex than installing a regular fibreglass pool. A significant amount of extra structural work is required during the pool construction process to ensure your infinity pool is strong and durable enough. The type and extent of this work will depend on the shape of your backyard and the design you want for your pool. If the pool can be installed in-ground, like a regular pool, it will still require concrete beam retaining work to support the sides and top of the disappearing edge. However, if your pool needs to be installed partially or fully above-ground, as most infinity pools do, this requires a different construction process to give the pool the strength and support it needs. Compass Pools Australia’s pioneering Maxi Rib technology has been designed specifically for this purpose. Exclusive to Compass Pools, the Maxi Rib system can support a fibreglass pool either partially or completely above ground, by creating a super-strong rib-like structure beneath the pool to hold its weight. Your infinity pool is then guaranteed to be strong, safe and durable for many years into the future. Maxi Rib technology enables infinity pools to be constructed on the vast majority of sites, whether sloped, flat or raised. Thanks to this innovation, fibreglass infinity pools are now being created on many sites where previously this might not have been possible, or the owners may have had to opt for a much more costly concrete pool instead. The main reason why infinity pools are so expensive is because two pools essentially have to be constructed on the same site at the same time. The main pool that you swim in has the disappearing edge, but the water that falls off this edge has to go somewhere. This is why another smaller pool is constructed at a lower level, which catches the water that spills over the infinity edge. This second pool is completely hidden so you can’t see it at all from the main pool, as it is built beneath the infinity edge. However, the second pool still has to be able to hold one-third of the water capacity of the main pool in order to be fully functional. This makes the construction process of an infinity pool more time consuming and complex, requiring a great deal more work than the process of installing a standard pool, as two pools are being built at once. Each infinity pool construction project requires a specialist engineer on-site. This engineer is responsible for the design of the entire project, including hydraulics, ground support, the design of the pool support and the holding capacity. This gives you the reassurance that your infinity pool installation has been overseen by an expert at every stage, ensuring that everything goes to plan and your finished infinity pool will be a safe and relaxing environment for swimming. Does the size affect the infinity pool cost? The size of your infinity pool does not affect its cost as much as you might think. The same technology is used to create infinity pools of all sizes, and the amount of work required in the construction process is practically the same. Because of this, the total costs for infinity pools of different sizes are surprisingly similar, so there is no need to limit yourself to a smaller infinity pool if a larger pool would be more appropriate for your needs. 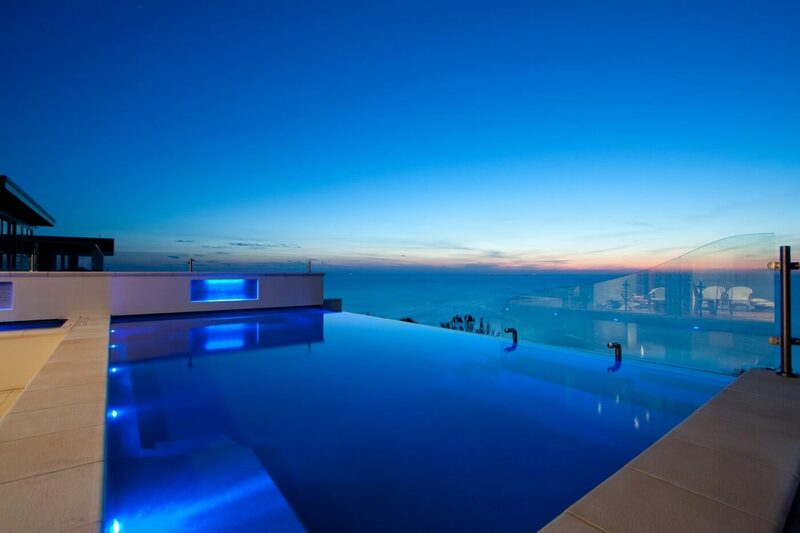 However, infinity pool costs can be affected by a number of other factors. For example, the cost can increase if you want your disappearing edge to go round a corner, as this makes the construction process more complex. You can also pay more for your infinity pool depending on the extras you choose. A self-cleaning system, for example, will increase the cost of your pool. However, you may decide this is worth it in the long run. An in-floor cleaning system such as the Vantage system designed by Compass Pools Australia saves you the time and hard work of cleaning your pool manually, leaving you with more free time for enjoying your pool. It can also help you save money long-term, as it requires far less chemicals than manual cleaning, which also makes your pool safer and healthier to swim in. Your pool company will be able to advise you on the range of optional extras which are available for your infinity pool. It is then up to you to work out your budget and stick to it while deciding what your infinity pool should include. Remember, you will also have to consider elements such as lighting, heating and landscaping, so your infinity pool is highly reliable and looks as beautiful as possible in your backyard. If you would like to find out more about infinity pools, or discuss the specific options available for creating an infinity pool in your backyard, please contact one of our experienced Compass Pools builders who will be happy to answer all your infinity pool questions.